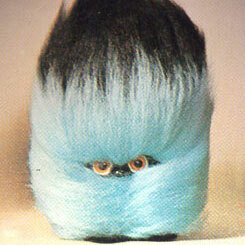 Hairy Glooks were just one of many weird toys that were foisted on the newly-consuming baby boomer generation and as it happens, they were hugely popular when they hit the market in the 1960s -especially in Australia where they sold in numbers that sent a toy manufacturer's heartbeat thumping with excitement. Although they originated in the UK, there was something about Glooks that resonated with the Australian psyche , though I shudder to think what that mysterious connection could have been. 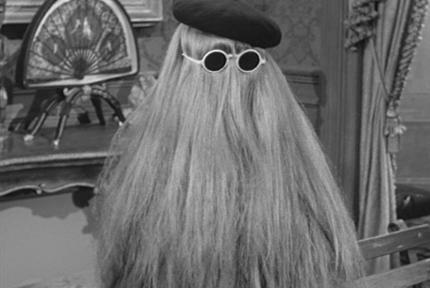 Was Cousin It a beatnik? In their day, they were a great novelty..something new and hairy and..er, Glooky. Possibly inspired by the hirsute Cousin It of Addams Family fame, Glooks were a mass of non-toxic (I think) synthetic fibres. It seems kids, mainly girls, just loved fiddling with their hair; brushing, twisting, plaiting and gathering it in up into top notches and ponytails. Let's face it, hair was something Glooks had plenty of. In fact, that's virtually all they had -well, apart from token tiny feet, a couple of eyes and a round nob of a nose. Of course unlike their upmarket and expensive descendants, the Furbies, Glooks possessed very little by way of whizz bang features. They couldn't walk, talk and didn't even have any sort of mechanical device or computer chip inside - how primitive! Eventually, as the 70s and 80s dawned, Glooks faded from view. They were, I suppose, a fad and like most fads, they passed through a period of frenzied popularity and then receded into obscurity. Just as well this once loved toy has been carefully preserved for posterity by the Australian Glook Museum.